Sprint 2 is a two player overhead-view arcade racer released in 1976 by Kee Games. It was the first in a series of racing games from Atari and Kee Games, a wholly owned subsidiary of Atari. Sprint 2 is believed to be the first Atari product to feature the well-known 'Atari arcade font'. 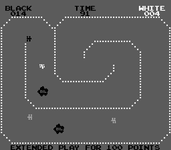 Sprint 2 evolved from the two player racing game Gran Trak 20, but included a microprocessor (the 6502), a first for racing games. This allowed Sprint 2 to include two computer-controlled cars, better graphics, and more tracks. Unlike Gran Trak, Sprint 2 did not have brake pedals, but the players could still make their cars "fishtail" by turning their steering wheels abruptly. Sprint One was released in 1978. The "One" in the title reflects the number of players rather than indicating it was a prequel. Sprint 4 and Sprint 8, a 4 player and 8 player version respectively, were released in 1977. Both were full color raster versions of the game. The Sprint franchise regained life in 1986 with Atari's release of Championship Sprint and Super Sprint, two and three player racing games with color graphics. These also inspired a sci-fi racing/car combat game, Badlands. Source: Wikipedia, "Sprint 2", available under the CC-BY-SA License.